Cramp bark is a deciduous shrub native to Europe and naturalized in North America. 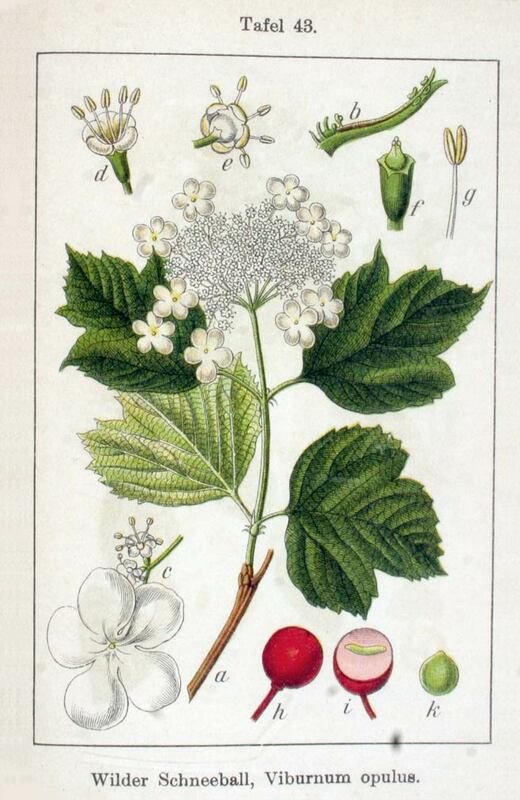 The plant is known by many common names, the best known being Guelder Rose in honor of the Dutch city of Gueldersland where formal cultivation of the plant originated. Cramp bark is a national symbol of Ukraine, where the plant is called Kalyna and depicted in traditional folk art, most notably in embroidery. Historically, as the name suggests, the bark of this shrub is made into extracts and tinctures, while the dried berry is used to make dark dye and ink. Viburnum opulus is a species of flowering plant in the Adoxaceae family (formerly Caprifoliaceae). It is a deciduous shrub growing to 4–5 m (13–16 ft) tall. The leaves are opposite, three-lobed, 5–10 cm (2–4 in) long and broad, with a rounded base and coarsely serrated margins; they are superficially similar to the leaves of some maples, most easily distinguished by their somewhat wrinkled surface with impressed leaf venation. The leaf buds are green, with valvate bud scales. The hermaphrodite flowers are white, produced in corymbs 4–11 cm (2–4 in) in diameter at the top of the stems; each corymb comprises a ring of outer sterile flowers 1.5–2 cm in diameter with conspicuous petals, surrounding a center of small (5 mm), fertile flowers; the flowers are produced in early summer, and pollinated by insects. The fruit is a globose bright red drupe 7–10 mm diameter, containing a single seed. The common name guelder rose relates to the Dutch province of Gelderland, where a popular cultivar, the snowball tree, supposedly originated. Viburnum opulus is native to Europe, northern Africa and central Asia. Cramp bark grows in scrub, woodland, forest edge, as hedges, and in cultivated gardens in sun to part shade. Cramp bark does well in most soils but is ill-adapted for poor soils and for dry situations. It prefers a deep rich moist loamy soil. Sow seeds in a cold frame as soon as it is ripe. Germination can be slow, sometimes taking more than 18 months. Transplant into pots when large enough to handle. These plants can also be propagated by cuttings or layering. The bark is stripped from the tree in fall or early spring, then dried and cut into small pieces or powdered. Store dried cramp bark pieces or dried cramp bark powder in an airtight container in a cool, dry place. Cramp bark is a shrub native to the woodlands and thickets of Asia, Europe and North America and a member the Viburnum genus. Since the small tree sports leaves that resemble maple, globe-shaped flower heads and colorful berries, the plant has earned a place as a garden ornamental. 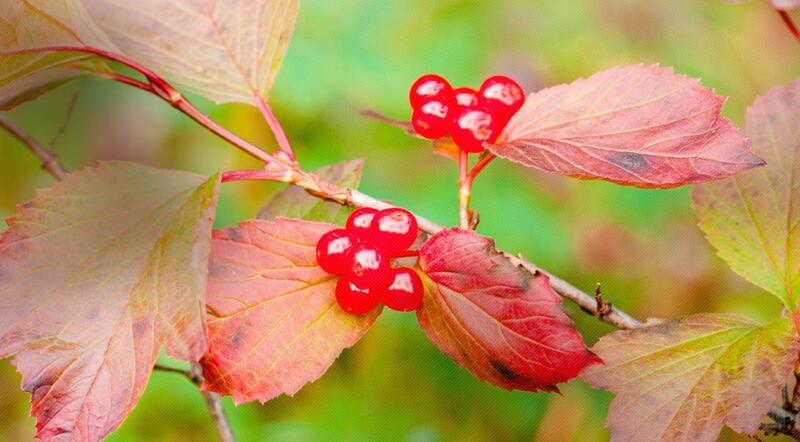 However, the berries are used to make jelly and the dried bark is used for medicinal purposes. In fact, as the common name implies, cramp bark is a traditional remedy for menstrual cramps. Other common names for Viburnum opulus include European Cranberrybush, Snowball Tree, Whitten Tree, Guelder Rose, Squaw Bush and Pimbina. The dried cramp bark is traditionally used as a muscle relaxant and antispasmodic, sometimes in combination with valerian. The Meskwaki tribe of Wisconsin used cramp bark to treat menstrual cramps, arthritis and back pain, while the Penobscot people of Maine used the herb to counter swollen lymph glands and gout. The Iroquois specifically used the bark to treat a prolapsed uterus post-childbirth. Due to the ability of cramp bark to ease contractions of the uterus, it was also used to prevent miscarriage. However, since the safety of this herb during pregnancy has not been established, it should be avoided. The active principles in cramp bark are catechin tannins, hydroquinones and coumarin compounds. According to an early study published in the Journal of Medicinal Chemistry, the antispasmodic properties of cramp bark are due to the presence of coumarin scopoletin. More recently, Chinese scientists have found that this compound effectively reduces pain, inflammation and uric acid levels associated with rheumatoid arthritis. A decoction of cramp bark may be taken in four fluid ounce doses, four to six times per day, during menstruation. Note that this herb may increase the effects of certain medications, such as blood-thinning drugs and diuretics.